Then it's time to stop paying for things that do not help your business. We have worked on a system that can guarantee a HUGE boost to your Alexa ranking no matter the time you registered your domain name. We guarantee that your Alexa ranking will INCREASE DRAMATICALLY AND FAST. Our network spends thousands of dollars each month in generating traffic from high traffic websites. We use a part of our U.S. Web traffic to increase your Alexa ranking. We know exactly how to proceed and we did this before for many other sites. 30 DAYS Alexa boost package. Get your 1 month Alexa ranking over 30,000, GUARANTEED OR YOUR MONEY BACK. 90 DAYS Alexa boost package. Get your 3 month Alexa ranking over 30,000, GUARANTEED OR YOUR MONEY BACK. Even sites that are ranked above 100,000 can benefit from our Alexa boost service. Our customers' sites have jumped to 11,000 from 60,000. Stop loosing your time and money in trying to buy traffic that is dedicated to Alexa. 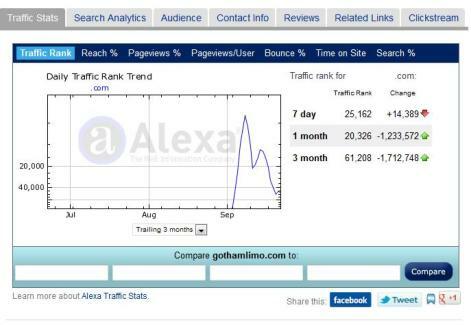 We provide reliable and steady Alexa traffic for a whole month for only $429 per month. Renewals can be done automatically as per your request but all payments on this site are one time by default when you join our program. You won't be billed again unless you contact us and request a subscription link at the end of the first period. Fast results. You will be able to follow and see the results from the Alexa official site within 3 days. This is all Alexa traffic, boost your Alexa ranking. We now offer 7 DAYS trial package for those who want to see results on the 7 day Alexa chart before paying for the full month. The trial package can be used just ONCE per domain and it is a one time cost. Guaranteed Alexa Ranking Cost $/DAY Buy Now! STOP paying for traffic that does not HELP ! If we fail to have your website ranked in the TOP 30,000 sites listed in the official Alexa site at the end of the period specified with your package, we will fully refund your payment. You have absolutely nothing to lose with our unique Alexa Ranking Boost service. All packages listed on this page are one time cost. Please contact us to request a subscription link if you want to be billed automatically.